Starter engine PNVS10U2, key "Riga" 380VAC, 6.3A Actuator PNVS10U2 is used for starting and stopping of single-phase motors with short-rotor with starting coils up to 0.6 kW at voltage up to 380 VAC and current 6.3 A. 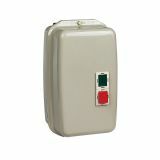 Motor Starter VCX5-9, 220 VAC, 10 A, 4-6 A Motor Starter VCX2-9 ,with coil 220 VAC and rated current 10 A. List Price 42.90лв. VAT Incl. 38.61лв. VAT Incl. List Price: 43.50лв. VAT Incl. Motor Starter AGMW-22B, 220 VAC, 22 A, 12-18 A Motor Starter AGMW-22B ,with coil 220 VAC and rated current 22 A. List Price 51.50лв. VAT Incl. 48.92лв. VAT Incl. Motor Starter VCX2-25, 220 VAC, 30 A, 17-25А Motor Starter VCX2-25, with coil 220 VAC and rated current 30 A. Motor Starter QCX2-40, 220VAC, 40A, 30~40A Motor Starter QCX2-40,with coil 220 VAC and rated current 40 A. 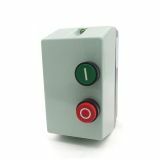 Motor Starter ТАХ 1-1.6А, 380 VAC, 1.4 A, 1-1.6 A Motor starter TAX ,with coil 380 VAC and rated current 1.4 A. Motor Starter QCX2-09, 380 VAC, 9 A, 7-10 A Motor Starter QCX2-09, with coil 380 VAC and rated current 9 A. Price 30.03лв. VAT Incl. 28.53лв. VAT Incl. List Price 42.90лв. VAT Incl. 40.75лв. VAT Incl. List Price: 42.90лв. VAT Incl. Motor Starter QCX2-12 , 380VAC, 12A, 9-13A Motor Starter QCX2-12,with coil 380 VAC and rated current 12 A. List Price 43.50лв. VAT Incl. 41.32лв. VAT Incl. 39.15лв. VAT Incl. 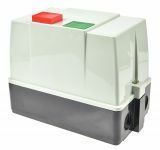 Motor Starter VCX2-18, coil 380 VAC, 18 A, protection 12-18 A Motor Starter VCX2-18 ,with coil 380 VAC and rated current 18 A. List Price 49.50лв. VAT Incl. 47.02лв. VAT Incl. 44.55лв. VAT Incl. 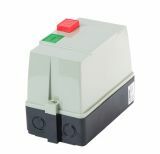 Motor Starter QCX2-25, 380 VAC, 25 A, protection 25A Motor Starter QCX2-25 with coil 380 VAC and rated current 25 A. List Price 59.90лв. VAT Incl. 56.90лв. VAT Incl. Motor Starter QCX2-40 380 VAC, 45 A, 30-40 A Motor Starter QCX2-40 ,with coil 380 VAC and rated current 45 A. List Price 102.00лв. VAT Incl. 96.90лв. VAT Incl. Motor Starter QCX5-40, 220 VAC, 40 A, 24-34 A Motor Starter QCX5-40, with coil 220 VAC and rated current 40 A. Motor Starter QCX2-65, 380 VAC, 63 A,55-70 A Motor Starter QCX2-65 ,with coil 380 VAC and rated current 63 A. List Price 117.60лв. VAT Incl. 111.72лв. VAT Incl. 105.84лв. VAT Incl. Engine starters are devices that directly start, control and remotely protect asynchronous electric engines (motors) or other electrical consumers. Their main parameter is the rated coil voltage. Vikiwat Ltd. offers starters with voltage 380 VAC and 220 VAC for various rated currents. They are enclosed in a metal box with the necessary degree of protection against dust and moisture. They are usually mounted on a wall or on the device itself. Widely used quality and reliable electromagnetic starters at competitive prices.